Like the glucocorticoid receptor, the mineralocorti-coid receptor resides in the cytoplasm in the unoccupied (by ligand) form and also appears to contain hsp 90 in a heteromeric structure. Different from the glucocorticoid receptor, it appears that aldosterone binds in the binding pocket of the mineralocorticoid receptor D ring first, as contrasted with A ring first in the case of the glucocorticoid receptor (Figure 10-28). In addition, there seem to be three possible configurations of aldosterone, as shown in Figure 10-29. There may be a preponderance of the C-ll hemiacetal form, and this may be the major form binding to the mineralocorticoid receptor. Presumably the mineralocorticoid receptor undergoes activation-transformation in the cytoplasm and is transported into the nucleus by mechanisms similar to those described for the glucocorticoid receptor. An important issue is the crossover of ligand binding, and the mineralocorticoid receptor is an effective binder of Cortisol. Thus, when Cortisol is not inactivated by kidney 3/3-hydroxysteroid dehydrogenase, to produce the inactive hormone, cortisone, Cortisol can bind to the kidney mineralocorticoid receptor and enhance Na+ uptake by stimulation of the sodium ion channel, leading to increased blood pressure. On the other hand, aldosterone is not an effective ligand for the glucocorticoid receptor. FIGURE 10-32 Idiopathic Addison's disease. 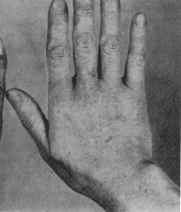 The pigmentation of the hand on the left is contrasted with that of a normal hand. Reproduced from Ezrin, C., Godden, J. O., Volpe, R., and Wilson, R. (eds.) (1973). "Systematic Endocrinology," p. 178. Harper & Row, New York. receptor, suggesting that it could enter the binding pocket A ring first, and the bulky substituent of C-ll may account, at least in part, for its inhibitory properties. Other work describes membrane mineralocorticoid receptors. These receptors may be linked to the Na+-H+ antiporter located in nonepithelial cells such as lymphocytes and smooth muscle cells and are apparently insensitive to Cortisol and spironolactone, a mineralocorticoid receptor antagonist whose structure is shown in Figure 10-29. The mineralocorticoid receptor should activate the transcription of specific targets such as the a-subunit of the Na+,K+ ATPase of the kidney. However, there appear to be cases where the mineralocorticoid receptor, the glucocorticoid receptor, and both ligands are present. From experiments, it has been learned that the glucocorticoid receptor and the mineralocorticoid receptor can form a heterodimer that is less active as a transcriptional activator than either homodimer. This level of control undoubtedly will command future investigation. Synthetic antagonists of aldosterone action are available and are known as spironolactones. The structure of spironolactone is given in Figure 10-29. This substance has no Na+-conserving action on its own, and its action appears to be through competition for aldosterone binding at the ligand-binding site of the aldosterone receptor. Although some other compounds have indirect antimineralocorticoid effects, spironolactone is the compound used most frequently. More than a dozen metabolites of radioactive aldosterone have been characterized in the urine. Nearly all of the hormone is metabolized within 48 hr. The major urinary form is a glucuronide derivative obtained by substitution of the reduced C-3 position. Conjugation occurs in the liver and kidney.